Dr. Akhilesh Kumar has a PhD in Cellular Biology from the prestigious Jawaharlal Nehru University, New Delhi, India. His PhD work involved investigating the role of adenylate cyclase in the proliferation of ameboid protozoan Dictyostelium discoideum. After completing his PhD, Dr. Kumar he moved to U.S to expand his research skills and has amassed a variety of experience in molecular, cellular biology and Pharmacology area during his 10+ years of post-doctoral training. He has worked in research areas related to cell motility, thyroid cancer, glaucoma, and inflammation areas. During his research career he has published extensively in high impact peer reviewed research journals (click here for a full list of publications). During his position at Dept. of Pharmacology and Toxicology, University of Louisville, he spent four years investigating the role of endocannabinoids and novel cannabinoids (the active constituent of cannabis derived drugs), in glaucoma. In the glaucoma research, he found that the cannabinoids can bind to different G-protein coupled receptors other than the classical cannabinoid receptors (CB1 and CB2) and regulated the complex cannabinoid signaling. He found that the cannabinoids can reduce the intra-ocular pressure which is believed to one of major causes of glaucoma. Furthermore, he has also worked in area of glycogen synthase kinase, nicotinic receptor and inflammation wherein he studied the role of nicotine in regulating the pro-inflammatory cytokines. 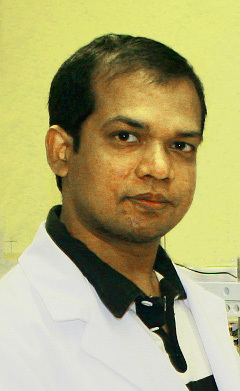 Currently, Dr. Kumar serves as the Research and Development Scientist for Phytosciences in which he utilizes his extensive experience as a research scientist in a laboratory to provide clients with the framework to design and develop validated analytical protocols and methods, equipment selection and optimization, and design of testing facilities to enhance productivity. In addition, Dr. Kumar works with Dr. Jones (Director of Clinical Research) to develop the structural framework to provide a platform for the development of cannabis research experiments focused on product development.